General Description: It is a perennial herbaceous plant with creeping and twining stems that grow along the ground and up through other plants and structures. It has an extensive system of rhizomes that can grow deep into the soil. Flower Description: Flowers are bell or funnel-shaped, white to pinkish and approximately 1 inch in diameter. They have 2 small bracts located 1 inch below the flower. Leaf Description: Leaves are alternate, more or less arrowhead-shaped and have pointed or blunt lobes at the base. Stem Description: Stems are perennial and deciduous, growing along the ground and twining around and through other plants, to around 6.5 feet in length. Fruit/Seed Description: Seed in a small capsule, about ¼ inch in size. 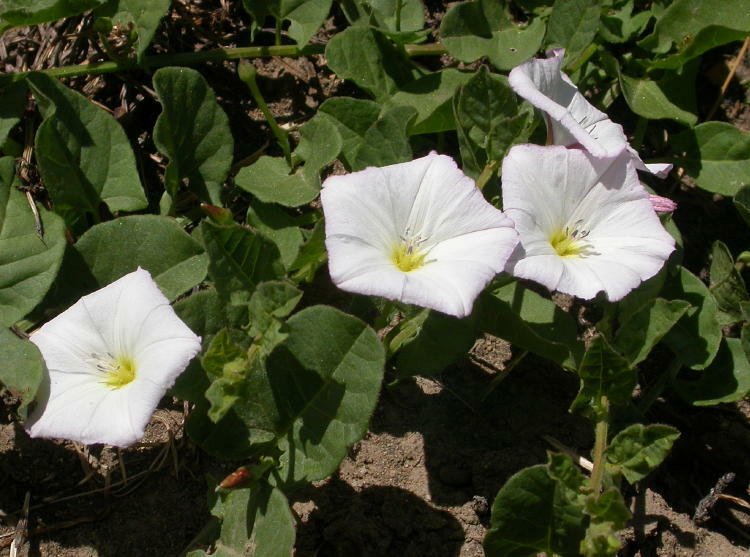 Once established, field bindweed is nearly impossible to fully eradicate. It outcompetes native plants species and can reduce crop yields. It forms an extensive root system, often climbing or forming dense tangled mats.